Summer is rocking and rolling at Lone Star College-CyFair with youth summer camps, a children’s theatre show and the annual Summer Reading Program. LSC-CyFair’s popular Discovery College provides fun while learning new and exciting things every day for ages 6-14 with STEM-based (Science, Technology, Engineering and Math) sessions as well as sessions designed specifically for teens to help build self-esteem, set goals and plan for college. Come learn and explore at one-week June sessions such as Geology Rocks, Lone Star Treasure Hunt, GeoTech Adventures, Old School Games, Cosmic Exploration and Backyard Detectives. Among the July sessions available are: Molecular Gastronomy, Crafty Creations, 101 Amazing Science Facts and Lone Star CSI. Morning sessions and afternoon sessions are available June 11-28 and July 9-12. For registration and schedule information, go to LoneStar.edu/youth-classes-cyfair. Take a break from the heat for some summer laughs and join “Awesome Allie: First Kid Astronaut” in her outer space adventure on the Main Stage Theatre July 9 - July 12. With the help of her trusty talking dog Captain Chaos and Rover the Dancing Robot from Mars, Allie’s on a mission across the solar system to save Earth, and maybe learn some things about science along the way. But she’d better be home in time for dinner! LSC-CyFair’s drama faculty Matthew Beckham directs the $5 performances, which includes four 10 a.m. shows and one 7 p.m. show. Get information and tickets at LoneSrtar.edu/box-office-ticket-info. On the other side of the Barker Cypress campus, book clubs, crafts, laughter and learning are available for children, teens and adults June 4 – Aug. 4 with the annual Summer Reading Program. This year’s theme is “Libraries Rock!” and all activities are free. In the library’s Kids’ Corner are baby, toddler, pre-school, Spanish and family storytimes as wells as crafts, book clubs, family fun nights and more. The summer weeks feature Monday at the Movies and Special Activities for all ages with magicians, musicians, puppeteers and dancers. There are Tween Tuesday Crafts for ages 10-12 and Tween STEM Wednesdays focused on robotics, circuits and forensics. In addition to weekly L.I.F.E. programs, there are also book clubs, computer workshops, a writer’s group and more available for adults. 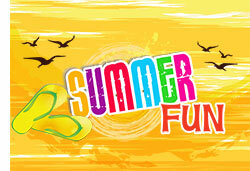 Stay cool this summer with activities held at LSC-CyFair located at 9191 Barker Cypress.